Another baking post! Something about the colder weather turns me into a baking fiend. And this one is about one of my favourite autumn/winter ingredients… oats. Oats with everything, I say. The other day I got a craving to make flapjacks. They are SO simple to make for a quick sweet fix. What I love about them is that you can make them out of lots of odds and ends you’re likely to find in the back of the cupboard. Here’s how I made them, but I’ve listed possible alternatives in brackets. Why not give them a go this weekend? Handful of pumpkin seeds (or any seeds or nuts). I use half jumbo and half milled oats for the perfect chunky texture that doesn’t fall apart. The banana helps everything stick together and is a healthier alternative to using all butter. And the seeds add a lovely savouriness to flavour to counteract the sweetness. Preheat oven to 150c/Gas mark 2 and line a deep baking tray. Melt butter, sugar and honey in a large pan and heat until it starts to bubble. The longer you leave it the more sticky and caramel like but make sure it doesn’t burn. Mash the banana until smooth then add to the mixture. Remove from the heat and add the oats, stirring until they’re well coated. Stir in the rest of the dry ingredients (fruit, seeds, etc.) then turn out into the tray before placing in the oven for 45 minutes. 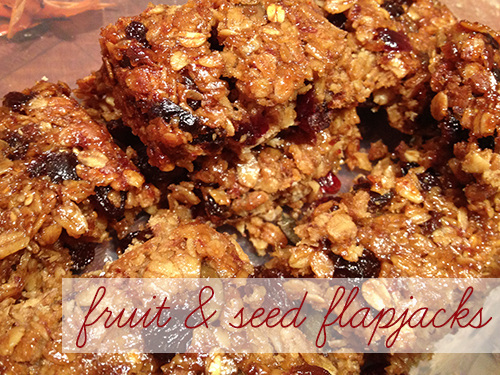 This entry was posted in 2013, autumn, baking and tagged baking, flapjack, fruit, oats, seeds. Bookmark the permalink.